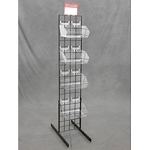 The Gondola Slatgrid Display Rack stands at five-feet and is a wonderful addition to your display fixture inventory! Overall width of this retail store fixture is approximately four-feet wide. The wire stand is constructed of four two-foot wide metal grid panels. 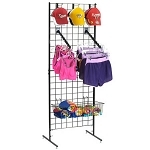 Display your product with this metal rack and customers will be sure to find what they are looking for. Available in three wonderful colors makes coordinating your display and décor so much easier. Choose your metal floor fixture to be either black, white or chrome. The chrome material is slightly more expensive, just remember it will be a little bit higher in price when purchasing. Some assembly is required for this retail stand, but it is made simple with the included six connectors. 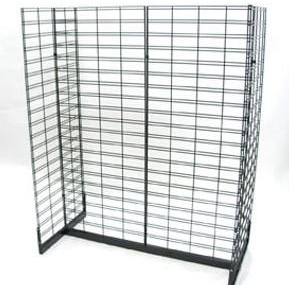 Invest in your metal grid wall gondola display by purchasing yours today at Candy Concepts Inc. with just a click.